Identify and calculate the measure of angles such as complementary, vertical, supplementary, and adjacent angles in this challenging Angles Math Test. This test has ten problems that require students to use the characteristics of the different types of angles (supplementary, complementary, vertical, and adjacent) to identify the angles. 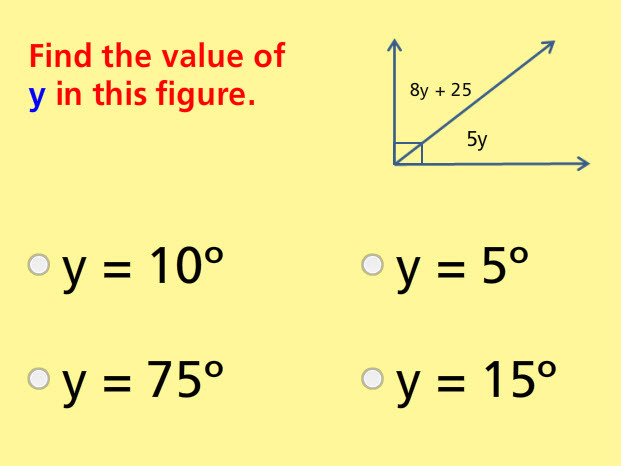 Also, the student must use knowledge about angles to solve equations. Return from this Angles Math Test to the Middle School Math Tests, 8th Grade Math Tests webpage, or to Math Tests.